UNIVERSITY PARK — The national tour of Rodgers & Hammerstein’s “The King and I,” a NETworks Presentations LLC production based on the 2015 Tony Award-winning Lincoln Center Theater Production, will make its Penn State premiere at 7:30 p.m. Thursday in Eisenhower Auditorium. 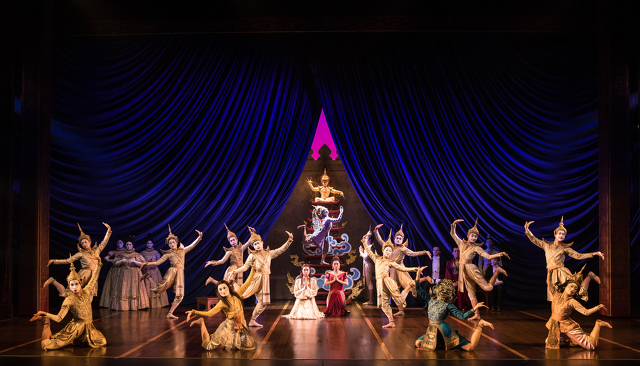 One of Rodgers & Hammerstein’s finest works, “The King and I” boasts a score featuring such beloved classics as “Getting to Know You,” “I Whistle a Happy Tune,” “Hello Young Lovers,” “Shall We Dance” and “Something Wonderful.” Set in 1860s Bangkok, the musical tells the story of the unconventional and tempestuous relationship that develops between the King of Siam and Anna Leonowens, a British schoolteacher whom the modernist King, in an imperialistic world, brings to Siam to teach his many wives and children. Section one and two tickets for the Center for the Performing Arts at Penn State presentation—$68 and $59 for an adult, $50 and $41 for a University Park student, and $51 and $42 for a person 18 and younger—are available online at www.cpa.psu.edu or by phone at 814-863-0255 or 800-ARTS-TIX. Tickets are also available at three State College locations: Eisenhower Auditorium, Penn State Downtown Theatre Center and the Bryce Jordan Center. Tony winner Sher reunited for “The King and I” with the creative team from the Lincoln Center Theater productions of “South Pacific” and “The Light in the Piazza.” The creative team for this new tour includes direction by Shelley Butler, based on Sher’s original direction, featuring sets by Michael Yeargan (Tony winner for “South Pacific” and “The Light in the Piazza”), costumes by Catherine Zuber (seven-time Tony winner, including “The King and I”), lights by Donald Holder (Tony winner for “South Pacific” and “The Lion King”), sound by Scott Lehrer (Tony winner for “South Pacific”), musical supervision by Ted Sperling and casting by Jason Styres, CSA. Choreography by Tony winner Christopher Gattelli (“Newsies”) has been recreated for this tour by Associate Choreographer Greg Zane, based on the original choreography by Jerome Robbins. The production features the musical’s original 1951 orchestrations by Robert Russell Bennet, with dance and incidental music arranged by Trude Rittmann. Audio description, which is especially helpful to patrons with sight loss, is available for this performance at no extra cost to ticket holders. Reservations are required by Thursday, March 14. To reserve the service, phone 814-238-0132. For more on the show, visit cpa.psu.edu/events/kingandi.